Losing home court advantage wasn’t the only bad thing about the bottom line in the game 2 loss to the Miami Heat. The Indiana Pacers found out that Paul George was suffering from a concussion at the end of the game, which might even deny him from playing in the next one if he doesn’t pass the tests of being fully cleared from the effects. Diving for a loose ball with Dwyane Wade, George got bumped on the head from behind by Wade which made him hit the hardwood. He was tested and cleared on the bench by the team’s medical staff, showing no signs of a lingering effect. However, some very bad decisions from George including turnovers that seemed uncharacteristic raised the question about his condition again. George later admitted he blacked out for a moment in the game, and was never the same. George was terrible before getting hit on the head, shooting 1-of-11 from the field through the first three quarters, but in the final minutes of the game, as the Miami Heat ran away with the win, George didn’t look like he was someone capable of playing basketball, and that makes even more sense as we learn more about the incident. George didn’t display symptoms of a concussion on the bench according to the Pacers, but he himself probably tried to hide what he was feeling. While it’s possible to catch on to concussion symptoms, sometimes having the person suffering from it lie about what’s going on with him can fool those performing the testing. After George talked to the media about blacking out, he was examined again the following day and was found to be suffering from a concussion by the team’s consulting neurologist because he said he lost consciousness the day before. According to the NBA the Pacers did everything according to protocol, and now George has to pass the tests in order to be eligible for game 3 on Saturday. 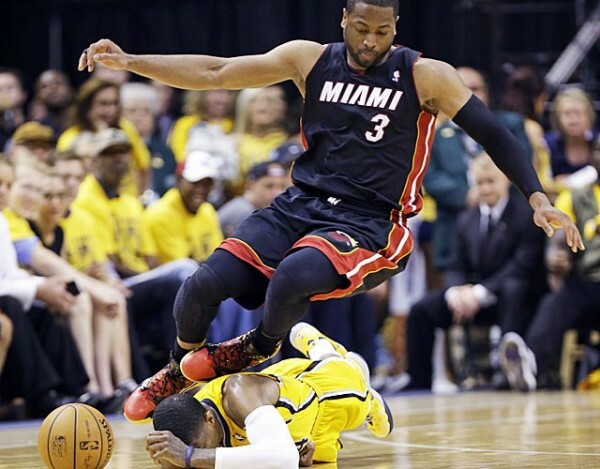 Those looking for controversies immediately talked about Wade hitting George on purpose. While Wade does have a suspicious line of injuries attributed to him, the most famous one being Rajon Rondo’s arm in the 2011 playoff series, claiming he hit George on the back of the head while falling down with his knees in the air on purpose seems a little bit too fantastical, even for those how hate everything about the Miami Heat.